Saturdays are reserved for a peek at the bookshelves which fill so many rooms in this old farmhouse. Books live everywhere here. 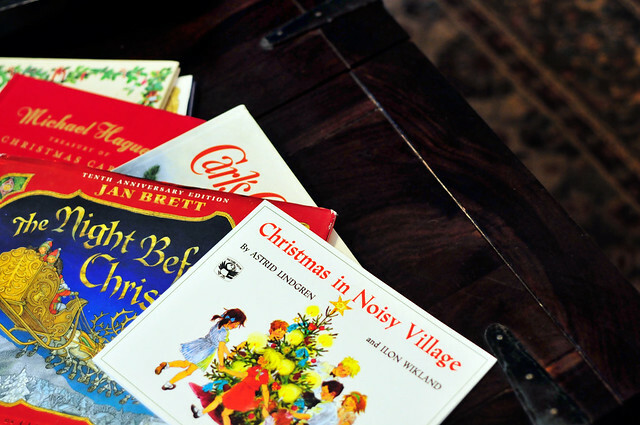 This month, this Advent month, I’ll be sharing some of our favorite books for the season. Advent books. Christmas books. Wintery and snowy books. These are books that live most of the year in two big boxes in a third-floor closet. I lug these boxes down two flights of stairs before I ever even look for the Christmas decor. Mostly, these are books for kids. Or the kid in each of us (a self we simply must indulge this time of year, in my opinion). Quite possibly, these books are loved more by me than by any child in my house. Although, considering the state of it, Jan Brett’s Gingerbread Baby is well loved by all. I love Luci Shaw’s Accompanied by Angels: Poems of the Incarnation year round. I love it especially at Advent. Shaw’s poems hit that magic mark for me. They are conversational yet lyrical. They are accessible, but they do not give up all of their secrets with one reading. These are poems to return to year after year. This is a fairly straightforward telling of a child’s Christmas in rural Sweden, but there is magic in realism like this. Gingersnap pigs, an early-morning sleigh ride to church, and gifts of skis and skates. ‘Everything is so beautiful and Christmasy that it gives me a stomach-ache,’ said Anna. I’m sad to see that this third recommendation appears to be out-of-print. However, it looks like you should be able to track down a copy without too much trouble. Little One, We Knew You’d Come is a sentimental favorite of mine. This is the story of the nativity, yes, but it is also a lullaby and a love song for every parent and child. Sally Lloyd-Jones is well known for The Jesus Storybook Bible: Every Story Whispers His Name . This is a quieter, more poetic take on the story of Jesus. I’m not sure my children even know it is a book about Jesus. They each think it’s a book about them. And they are right. Lloyd-Jones beautifully captures the longing and love parents feel for their children. It is the longing felt by all creation for her redeemer. Lastly, I have one bonus recommendation: Sounding the Seasons by Malcolm Guite. I’ve mentioned my love for these poems before, but, if possible, I love them even more this time of year. Love this!!!!!!!! My grandchildren ( yet unborn as all of my children are still in college and high school) need me to have all of these wonderful treasures in story form! And FYI…. Children’s books are for children all all ages! I’m sure that I will never outgrow them! I don’t want to outgrow them! I look forward to ordering your favorites that I don’t have. A challenge for today! Happy Advent! Oh those books sound amazing! And I’m always on the hunt for good poetry, especially for the kids, but never know where to start. Thank you! You are welcome, Lauren. Happy reading! Beautiful recommendations. Thank you Friend! Thank you, Summer! I’m grateful for your own Advent series this year. I’m finding it challenging in a very good way. I can’t believe they haven’t started re-printing “Little One”. I think I found our copy used but like new -and I still can’t read it aloud without my voice cracking. Me too, Kelli, me too. This one’s a tear-jerker, especially for all the mamas who’ve waited and waited … and waited some more. If you’ve not read The Church Mice at Christmas by Graham Oakley, with great illustrations that only add to the hilarity. Also, I did not see Madeleine L’Engle’s The Twenty-Four Days of Christmas. It’s a treasure to our family. I love that L’Engle book, too! I do not know The Church Mice at Christmas. Can’t wait to search it out. Thank you!